Many great projects were launched last year during the crypto craze. However even more bad projects were started as well. A common characteristic of the unsuccessful projects is lack of real world utility. The token you are investing in needs to fulfill a unique niche in a market that no other cryptocurrency can. A question to ask when considering a token’s utility: Why can this token, and their blockchains, solve the problem this project is looking to resolve? Why do you need a cryptocurrency to solve this issue? Almost all projects will say their solution is “decentralized”. This is not a unique characteristic of crypto projects. Make sure to always read the white paper to get the details about a project you are looking to invest in. Learn how to read a whitepaper in this article here. If the founders and main project managers do not have much background in the field, that is a red flag. If any of the members have a criminal background, that is an even bigger red flag. Learn as much as you can about the people you are considering to give your hard earned money to. In addition to sound fundamentals, the best cryptos have uptrending price action. You will need to have some understanding of basic technical analysis to determine this. But you simply just need to look for a series of higher highs and higher lows on the daily, weekly, or monthly time frames. The best cryptocurrencies to buy are in an uptrend, with not many resistance levels and overhead supply to stop a move upwards. Right now most cryptos are in a downtrend on their higher time frames. This is normal price action following a huge run-up in price like we had in 2017. Nothing can go straight up forever, and it is perfectly normal for cryptos to pullback after a big run up. Bitcoin has had similarly huge moves in the past decade before the 2017 run-up, and every time it followed a similar pattern. Big run up for several months, pulls back for a year or more, and then continues on its uptrend after it shakes out all the weak hands. You have to be patient for cryptos to resume their uptrend before buying and expecting it to appreciate in value in the near future. 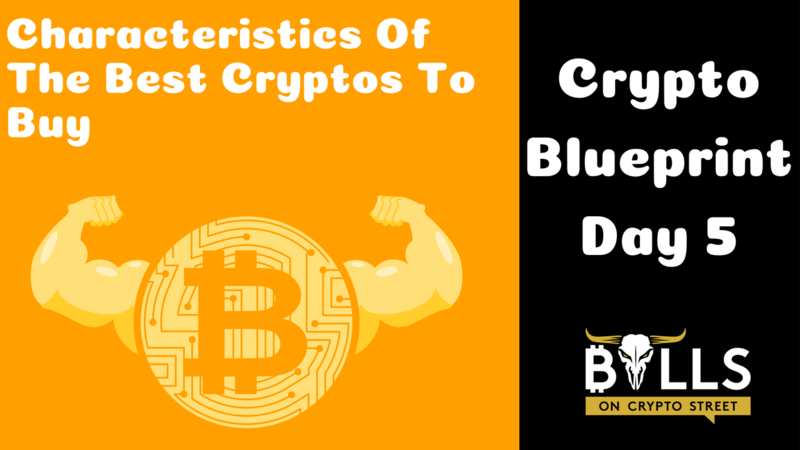 Volume is a crucial component to look at when looking to invest in a cryptocurrency. You need to see a cryptos volume to determine how easily you can enter and exit the market. Illiquid altcoins can drop a huge amount in a short period of time simply because there are so few buyers and sellers in the market that one seller can cause the whole market to drop big. Many pump and dumps are orchestrated around illiquid altcoins because they are easier to manipulate. Always check the 24 hour volume of the coins you are looking to trade on Coinmarketcap.com. If it trades less than $1 million during a 24 hour period it is considered too illiquid to trade in our opinion. If you missed day 4’s post about how to earn Bitcoin, check it out here. Make sure to sign up for our weekly newsletter below where you will get everything traders and investors need to know about the crypto market in an easy-to-understand, bite sized chunk.